But the machine metaphor lets us down badly when no part of the equation is constant, independent, or predictable. The new science of complex adaptive systems may provide new metaphors that can help us to deal with these issues better.3 In this series of articles we shall explore new approaches to issues in clinical practice, organisational leadership, and education. In this introductory article, we lay out some basic principles for understanding complex systems. A complex adaptive system is a collection of individual agents with freedom to act in ways that are not always totally predictable, and whose actions are interconnected so that one agent's actions changes the context for other agents. Examples include the immune system,4 a colony of termites,5 the financial market,6 and just about any collection of humans (for example, a family, a committee, or a primary healthcare team). In mechanical systems boundaries are fixed and well defined; for example, knowing what is and is not a part of a car is no problem. 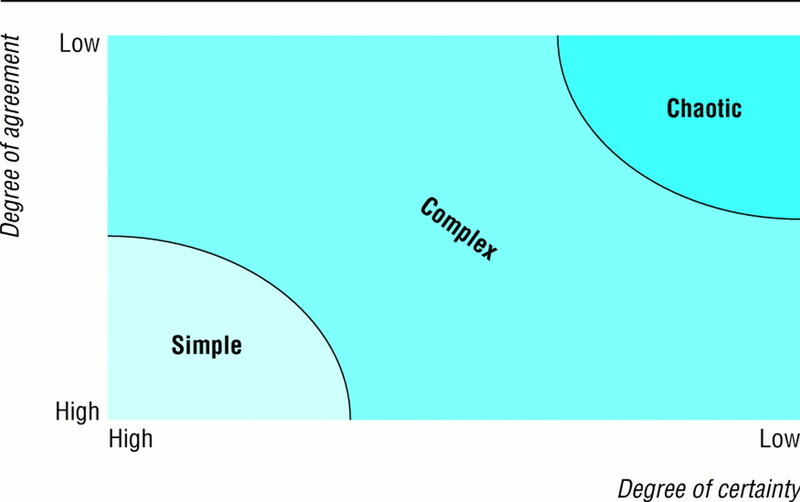 Complex systems typically have fuzzy boundaries. Membership can change, and agents can simultaneously be members of several systems. This can complicate problem solving and lead to unexpected actions in response to change. For example, Dr Simon (box) cannot understand why staff are so resistant to a small extension of surgery opening hours. Perhaps it is the fact that the apparently simple adjustment to working arrangements will play havoc with their own lunchtime inivolvlements with other social systems—be these meeting a child from school, attending a meeting or study class, or making contact with others who themselves have fixed lunch hours. Later, during an overbooked afternoon surgery, she sees Mr Henderson, a 71 year old widower who has diabetes and little in the way of social support. He has no new physical problems and Dr Simon notes that the patient was told last time to see her in six months' time—but once again he has returned after less than two weeks. She gives him five minutes and writes “Gen. chat” in his record. In a complex adaptive system, agents respond to their environment by using internalised rule sets that drive action. In a biochemical system, the “rules” are a series of chemical reactions. At a human level, the rules can be expressed as instincts, constructs, and mental models. “Explore the patient's ideas, concerns, and expectations” is an example of an internalised rule that might drive a doctor's actions. Because the agents within it can change, a complex system can adapt its behaviour over time.9 At a biochemical level, adaptive micro-organisms frequently develop antibiotic resistance. At the level of human behaviour, Mr Henderson (see box) seems to have learnt that the surgery is somewhere he can come for a friendly chat. As this example illustrates, adaptation within the system can be for better or for worse, depending on whose point of view is being considered. The evolution of one system influences and is influenced by that of other systems.10 Dr Simon and Mr Henderson have together evolved a system of behaviour; they have both contributed to the pattern of frequent visits we now observe. The health centre is also embedded within a locality and the wider society, and these also play a part in Mr Henderson's behaviour. A subsequent article in this series will explore how medical care for people with diabetes is embedded in wider social and other systems.11 Our efforts to improve the formal system of medical care can be aided or thwarted by these other more informal “shadow systems.”12 Since each agent and each system is nested within other systems, all evolving together and interacting, we cannot fully understand any of the agents or systems without reference to the others. Many will sympathise with Dr Simon's uneasiness about evidence based medicine. There is an insoluble paradox between the need for consistent and evidence based standards of care and the unique predicament, context, priorities, and choices of the individual patient. Whereas conventional reductionist scientific thinking assumes that we shall eventually figure it all out and resolve all the unresolved issues, complexity theory is comfortable with and even values such inherent tension between different parts of the system. The behaviour of a complex system emerges from the interaction among the agents. The observable outcomes are more than merely the sum of the parts—the properties of hydrogen and oxygen atoms cannot be simply combined to account for the noise or shimmer of a babbling brook.14 The next article in this series considers the application of complexity thinking in healthcare organisations; it will describe how the productive interaction of individuals can lead to novel approaches to issues.15 The inability to account for surprise, creativity, and emergent phenomena is the major shortcoming of reductionist thinking. This property of non-linearity appears in all complex systems. Dr Simon, for example, was surprised by the uproar over her suggestion of a seemingly small change—to remain open an additional 30 minutes during the lunch hour. Because the elements are changeable, the relationships non-linear, and the behaviour emergent and sensitive to small changes, the detailed behaviour of any complex system is fundamentally unpredictable over time.16 Ultimately, the only way to know exactly what a complex system will do is to observe it: it is not a question of better understanding of the agents, of better models, or of more analysis. Despite the lack of detailed predictability, it is often possible to make generally true and practically useful statements about the behaviour of a complex system. There is often an overall pattern.17 For example, Mr Henderson will turn up periodically in Dr Simon's surgery until something is done to alter his behaviour. We cannot predict the exact timing of his appointments or his chief complaint—nor is this detailed information necessary to deal with the problem. Complexity science notes a specific type of pattern called an attractor. Attractor patterns provide comparatively simple understanding of what at first seems to be extremely complex behaviour. For example, in psychotherapy, clients are more likely to accept a counsellor's advice when it is framed in ways that enhance their core sense of autonomy, integrity, and ideals.18 These are underlying attractors within the complex and ever changing system of a person's detailed behaviour. Relatively simple attractor patterns have been shown in share prices in a financial market,6 biological systems (such as beat to beat variation in heart rate19), human behaviour (such as Mr Henderson's frequent consulting), and social systems (such as nurses' staffing patterns on a hospital ward20). Doctors' behaviour is notoriously difficult to influence, but, as we shall illustrate in the article on organisational applications in this series,21 attractor metaphors can be used to identify potentially fruitful areas for work. Order, innovation, and progress can emerge naturally from the interactions within a complex system; they do not need to be imposed centrally or from outside. For example, termite colonies construct the highest structures on the planet relative to the size of the builders.5 Yet there is no chief executive termite, no architect termite, and no blueprint. Each individual termite acts locally, seemingly following only a few simple shared rules of behaviour, within a context of other termites also acting locally. The termite mound emerges from a process of self organisation. Langton has termed the set of circumstances that call for adaptive behaviours “the edge of chaos.”22 This zone (the middle area in the figure) has insufficient agreement and certainty to make the choice of the next step obvious (as it is in simple linear systems), but not so much disagreement and uncertainty that the system is thrown into chaos (figure).23 The development and application of clinical guidelines, the care of a patient with multiple clinical and social needs, and the coordination of educational and development initiatives throughout a practice or department are all issues that lie in the zone of complexity. Our learnt instinct with such issues, based on reductionist thinking, is to troubleshoot and fix things—in essence to break down the ambiguity, resolve any paradox, achieve more certainty and agreement, and move into the simple system zone. But complexity science suggests that it is often better to try multiple approaches and let direction arise by gradually shifting time and attention towards those things that seem to be working best.24 Schön's reflective practitioner,25 Kolb's experiential learning model,26 and the plan-do-study-act cycle of quality improvement27 are examples of activities that explore new possibilities through experimentation, autonomy, and working at the edge of knowledge and experience. Not all problems lie in the zone of complexity. Where there is a high level of certainty about what is required and agreement among agents (for example, the actions of a surgical theatre team in a routine operation) it is appropriate for individuals to think in somewhat mechanistic terms and to fall into their pre-agreed role. In such situations the individuals relinquish some autonomy in order to accomplish a common and undisputed goal; the system displays less emergent behaviour but the job gets done efficiently. Few situations in modern health care, however, have such a high degree of certainty and agreement, and rigid protocols are often rightly abandoned. This introductory article has acknowledged the complex nature of health care in the 21st century, and emphasised the limitations of reductionist thinking and the “clockwork universe” metaphor for solving clinical and organisational problems. To cope with escalating complexity in health care we must abandon linear models, accept unpredictability, respect (and utilise) autonomy and creativity, and respond flexibly to emerging patterns and opportunities. .The metabolic syndrome X.Ann N Y Acad Sci1999;892:1–24. .Images of organization.2nd ed.Thousand Oaks, CA: Sage,1997. .Complexity: the emerging science at the edge of order and chaos.New York: Simon and Schuster,1992. .Second generation immune networks.Immunol Today1991;12(5):159–166. .The insect societies.Cambridge, MA: Harvard University Press,1971. .A fractal walk on Wall Street.Sci Am1999;280(2):70–73. .Rationality. In: Osherson DN, Smith EE eds.An invitation to cognitive science: thinking., Vol 3Cambridge, MA: MIT Press,1990. .Coping with complexity: educating for capability.BMJ (in press). .Hidden order: how adaptation builds complexity.Reading, MA: Addison-Wesley,1995. .From life cycle to ecocycle: a new perspective on the growth, maturity, destruction, and renewal of complex systems.J Manage Inquiry1994;3:339–354. .Complexity and clinical care.BMJ (in press). .Strategic management and organizational dynamics.London: Pitman Publishing,1996. .The complexity of cooperation.Princeton: Princeton University Press,1997. .The quark and the jaguar: adventures in the simple and complex.New York: Freeman,1995. .Complexity, leadership, and management in healthcare organisations.BMJ (in press). .The essence of chaos.Seattle: University of Washington Press,1993. .Fractals: the patterns of chaos.New York: Simon & Schuster,1992. .A new language for psychoanalysis.New Haven, CT: Yale University Press,1976. .Nonlinear dynamics for clinicians: chaos theory, fractals, and complexity at the bedside.Lancet1996;347:1312–1314. .Chaos theory: a primer for health care.Quality management in healthcare1995;3(4):71–86. .Artificial life. Proceedings of the Santa Fe Institute. Studies in the sciences of complexity., Vol 6Redwood City, CA: Addison-Wesley,1989. .Strategic management and organizational dynamics.London: Pitmann Publishing,1996. .Edgeware: complexity resources for healthcare leaders.Irving, TX: VHA Publishing,1998. .The reflective practitioner.New York: Basic Books,1983. .Experiential learning. Experience as the source of learning and development.Englewood Cliffs, NJ: Prentice Hall,1984. .Developing and testing changes in delivery of care.Ann Intern Med1998;128:651–656.